These days, it’s hard to get patients to answer the phone. Even fewer patients take the time to listen to voicemails. Unfortunately, this means patients are even more likely than ever to miss their appointment. When you can’t reach your patients, you end up with empty appointment slots and lost revenue. Luckily, appointment reminder texts are an effective way of reaching patients in a timely way. As text messaging has become the preferred method of patient communication, it is now easier than ever to reach your patients. A quick SMS text message can easily replace a game of phone tag. And when you use OhMD to automate appointment reminder texts, you’re guaranteed to decrease appointment no-shows. There are all types of automated reminders. But you need automated reminders that actually work for your practice. Patients don’t want to be called during work or at home by robo-dialers. They aren’t likely to listen to voicemails or read emails, and even text messages can get annoying when they are clearly just being blasted out by a computer. This all feels like spam to patients. This is how OhMD is different. Our appointment reminder texts reach the patient via SMS like a personal text message from the practice appointment scheduler. It’s truly a dialogue between the patient and your practice. It allows you to replace cumbersome telephone conversations with efficient text conversations. Not only is this what patients are looking for in a modern practice, but it’s what your practice needs to be efficient and drive revenue that would otherwise be lost. 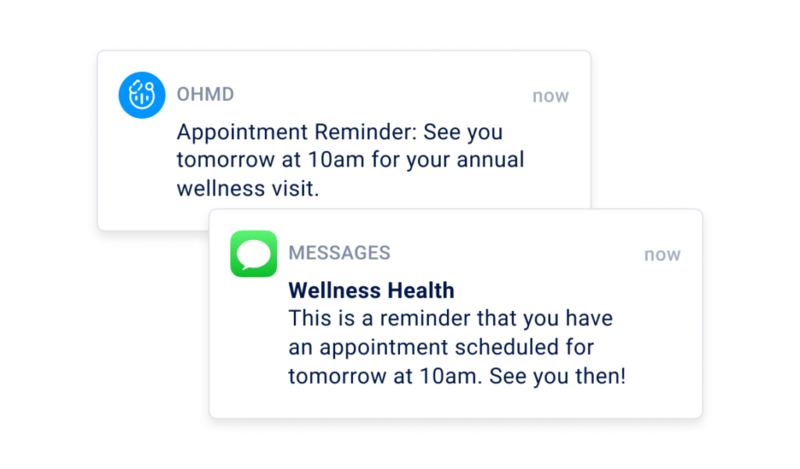 Each appointment reminder text message from OhMD can be personalized with the perfect combination of practice and patient information. It’s easy to send all your appointment reminders with customized practice name, patient name, appointment date, and even a greeting from someone at the practice. The more personal and interactive the text, the more likely the patient is to pay attention. We integrate with the industry’s leading electronic health record systems (EHRs) to automate SMS appointment reminders that really work. It’s that simple. Appointment reminder texts will reduce your no-show rate by up to 60%.